Thap Lamu Port is the main doorway to the amazing Similan islands and/or Myanmar. 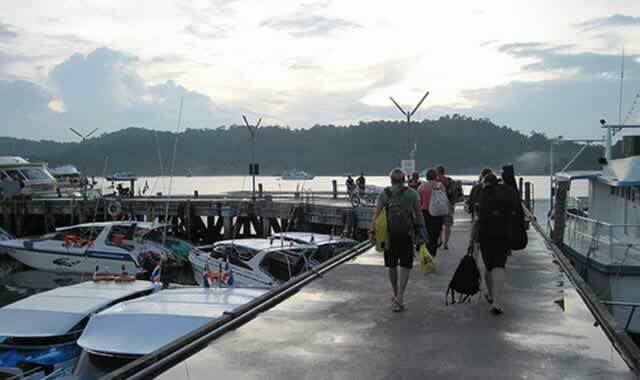 It has a deep water pier and is the closet point of land to the Similan dive sites. Taplamu, spelt several different ways, is also home of the Thai Navy’s 3rd fleet. And you can see several of their large frigates, and other military craft, just as you leave port. Taplamu is about 80 minutes away from the Similan Islands by speedboat and if you are on a Thailand Liveaboard or Day Diving boat this journey will take approximately 3-4 hours depending on the cruising speed of the vessel of course. There are diving day boats travelling to the Similans every day of the high season however, the Thailand liveaboards tend to leave at late afternoon or at night time, thus allowing you to wake after a night under the stars to the glorious sites that the Similans hold. Taplamu Pier is about 5 km off from the main route which takes you from Phuket Island to Khao Lak, so getting there via bus is quite easy -it’s even easy as part of a tour. The Similan Islands are surrounded by the Andaman Sea which is roughly 70 km due west of Khao Lak beach. There are many daily budget air-conditioned and VIP bus services direct from Bangkok’s southern bus terminal; these drive straight into Khao Lak. From Khao Lak to Tablamu is only a 10/15 minute trip to the pier by taxi. Other possibilities from the capital are travelling down by bus to the small town of Phang Nga Town. From Phang Nga Town it’s only 35 minutes then by bus to the Tap Lamu Pier junction. Coming from Phuket, it’s very easy to get to indeed, just hop on a bus from the Phuket Town bus terminal, destined for Khao Lak, and disembark at the Tap Lamu Pier junction, just ten minutes south of Khao Lak. Phuket International Airport, is the nearest airport to Thap Lamu. It has direct flights from Kuala Lumpur – Malaysia, Singapore, Hong Kong, Australia, and Bangkok as well as Europe and the UAE. From Phuket International airport you can take a taxi, which takes approximately 1 hour to Thap Lamu. Thap Lamu Pier is a bustling area with cars, trucks and minibuses so be careful, there are also many different boats and care must be taken getting in the boats from the pier. There are several little shops to buy last minute items such as snacks, sun cream and small items of clothing. There are also some small restaurants and bathroom facilities to use. Taplamu pier is an experience and the gateway to the most sensational scuba diving and snorkeling anywhere in the country guaranteeing you to have a ball of a time.